Upon its initial release in 1989, Nirvana’s debut record barely made a dent in the musical landscape of the time. 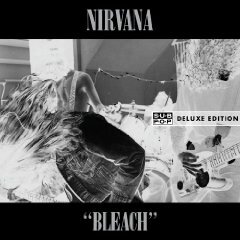 Famously recorded for $600, Bleach was a raw precursor to grunge music that would be thrust into the spotlight a short two years later when Nirvana’s sophomore record Nevermind ruled the charts. With a beautiful 48-page book of photos and oddities (such as a copy of the group’s contract with Sub Pop), the original Bleach long-player has been remastered for this newest re-release. Tacked onto the end of the original record is a 12-song concert, recorded in February 1990. The band sounds endearingly raw and less polished than what they would become in the years that followed but is a big part of the charm of Nirvana in the time period around the release of Bleach.